life was like during the Civil War. 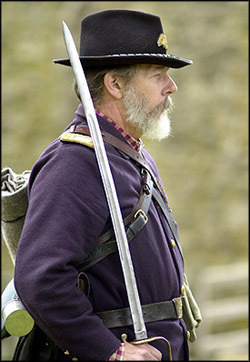 The two groups dressed in period uniforms, discussed military life, displayed equipment, erected tents, and demonstrated use and care of a musket. (left) Lonnie Cryan, of Oxford, who is the Captain of the 11th NJ Volunteers stands at attention. (above right) Phil Berg, of Long Valley, who is the Captain of Company G of 33rd New Jersey Infantry leads the troops in a demonstration. 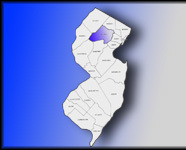 Nestled in the foothills of western Morris County lies is the township of Chester. It is responding these days to the sounds of growth. As one of the historic colonial towns of Morris County, Black River (now Chester) established itself as a settlement chiefly because of the intersection of two major Indian trails. These old Indian trails, used for hundreds of years by the Lenni Lenapes, were traversed by the earliest inhabitants as their peregrinations took them to western, northern and central areas of New Jersey. Most of the settlers moving into Chester came from Long Island. 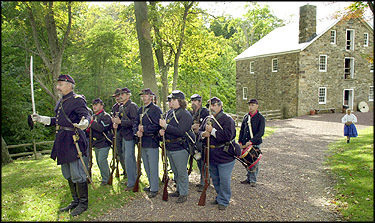 Some such as the "Rogerenes" came from Connecticut. These Quaker-Baptists tarried briefly in the Black River Area and then moved on, over Schooley's Mountain. By 1740 the road from New Brunswick through the forests of Peapack-Gladstone to Chester (roughly along Route 206) led into the small Chester location. From the area of Main Street, the road turned left and wound its way over Pleasant Hill. This was the Landing Road. It went down the mountain into Flanders and curved its way into Sussex through Landing, the Suckasunny Plains, into Sussex and iron ore territory. This was considered a "Grate Road" and was the connecting link to Raritan Landing (New Brunswick). Raritan Landing was the farthest inland ship port at that time. The other "Grate Road" came into Chester from Morristown. It passed through Mendham and Ralston to the "Crossroads". The "Grate Road" divided at the crossroads. One section went straight down the hill past Crystal Brook area and met the Landing Road to Sussex at Pleasant Hill. The other section turned left and continued through town joining the same Landing Road near the center. This was the section that came up from Raritan Landing. This "Grate Road" eventually went to Oldwick south and thence to Fairmount, Long Valley and west to Pennsylvania. These roads influenced the growth of early Chester. The Black River area was entirely agricultural. Grains were important food-producing crops. Flax was a crop that helped to strengthen Chester's economy, as well as sheep for their wool and cattle for their hides. Chester's unique position gave rise to taverns and over-night inns. In the early days the Hull-Brown Tavern on the Landing Road had a thriving business. Travelers came and went where the Landing Road branched and the owners had them coming and going. The building is still in existence as a private residence. One Jacob Drake, in 1779, turned a farmhouse into a tavern. This house at the Crossroads flourished for 183 years and then burned to the ground. Isaiah Fairclo had a tavern in the village close to the left turn of the Landing Road. Increased traffic through Chester made the town a popular "stopping off" place. The products of Pennsylvania passed through on the way to New York. Wheat, grains, vegetables and sundries, as well as the famous Chester applejack, passed through. Some fine furniture, notably, James Topping's clock cases and bureaus were sent to the New York market. Those travelers arriving at Chester were requesting comforts. The taverns and inns were lacking creature comforts. Isaiah Fairclo sold to Zephaniah Drake and to his father, Jacob, the corner lot where the Landing Road turned left. They erected "the Brick Hotel," the most elegant of the tavern/inns in the area. Transportation from the Brick Hotel to the city of Paulus Hook (Jersey City) was provided, using scarlet coaches trimmed with gold. Passengers complained about the bumpy roads and the miserable conditions. A "turnpike" was built that went from Morristown, through Mendham, "thence" through Chester to German Valley (Long Valley) up Schooley's Mountain through Springtown. There was a fee to ride this most convenient road , which opened Chester to a period of business decline. The roads were so improved that stopovers were no longer necessary for teamsters on their way to New York. Settlers passed through but no longer tarried. By 1844 Barbour and Howe described Chester as being "8 miles west of Morristown. The Washington Turnpike passes through it. There are 1 Presbyterian and 1 Congregational Church, 3 mercantile stores, 2 academies, 3 grain mills ,7 schools.... The inhabitants are mostly farmers.... Formerly much attention was paid to the culture of orchards of apple trees ...but they are now neglected.... and peach orchards are rising in their place. The village of Chester .....where the Post Office is located ....12 miles west of Morristown ....contains two churches and about 50 dwellings." The peach orchards were Chester's entrance to the markets on the east coast. The quality of the fruit was high. The crops were financially successful. Mechanical devices for ease in transporting the crops became a necessity. In the town, various machine shops began to manufacture the equipment. The Van Doren brothers carried on the production of threshing machines. 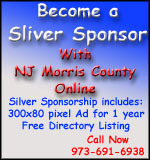 They introduced the first steam engine into Morris County. The forges and furnaces were all turning out iron tools and sundries. There was a brick yard and many distilleries. Gristmills were in every corner of the township. Chester had reached a high level of prosperous living. The Civil War changed Chester from a farming community to a small industrial town. Iron was the predominant fomenter. Iron mines opened a way of life that was financially comfortable, mechanically skillful, and highly profitable. Chester had a boom and the iron mines were the sole cause of considerable prosperity in Chester. Roads to convey the ore were built. There were at least thirty-five working mines in and around the town. A railroad was built and the ore as well as mail, passengers, and sundries were sent to Dover and then east. Chester's inhabitants lived in great style. There were academies, well-equipped stores, servants for the fortunate, both for house and yard. The homes were large and comfortable. There were churches for the people as well as schools. When iron was discovered in the Mesabi Desert in Minnesota, it heralded doomsday for the high iron life of Chester. Chester's mines had become expensive operations. They were deep and had been worked for so many years. The financial status of many was either lost or greatly depleted. Those who knew only mining were hard-pressed. Those who had retained their farms began again, raising crops. Their apples, peaches, garden produce, and grains helped to keep the economy alive. Chester became quiet, relaxed, and existed as a small farming community with beautiful homes and little money. Through this depression, Chester remained a crossroads center. Traffic flowed through town on the way to springs at Schooley's Mountain. Many families sojourned to Upper New York to visit relatives. Pennsylvania was a pleasant distance. The Delaware was a source of enjoyment. To the east, Newark and New York were cities that offered cultural benefits and boat rides up the Hudson. The roads south led to Princeton and to the state capitol at Trenton. In all Chester was forced to rest from the iron turbulence era. Chester had been incorporated as a township in 1799. When 1899 arrived, there were "pleasant sites, beautiful homes, a congenial environment, superb views, three churches, a three-division school, cordial business-like enterprising merchants, six general stores, and a fine embroidery mill." Five roads came together in the center of town. Chester clung to its old Indian trails. They were still in use. Names had changed, the routes remained the same. Chester had some fine hotels. The Chester House, the Union House at the Crossroads, and the Depot down by the Muskrat. Chester was now becoming a "summer resort" . To accommodate the summer influx and to join in the new prosperity that beckoned, the Chester Telephone Company, the Postal Telegraph Company, and the Western Union made connections here. Chester was touted as "fast gaining popularity as a summer resort .....a good public school, from primary to high school .....the Black River runs through town..... Chester is reached by two railroads-the Central and the D L and W..... Chester is the business center of an agricultural district..... Climate is healthful and agreeable, air pure and bracing, and region one of picturesque beauty..... along the Black River are many fine manufacturing sites. Land for factories..... Electric light and power are available..... Good railroad service..... plenty of labor available." The Library, the Fire Department and the new Township Hall came into existence. Automobiles were now part of the scenery. To accommodate these vehicles, roads were paved. No longer did Chester have ruts and ditches for the thoroughfare. The threat of War and then the entrance of the United States into World War I curtailed the economy of Chester and all plans for much industrial development halted. Chester remained a comfortable community with a slow, pleasant, laid-back way of life. After the war Chester again perked up as a summer place. The inns and hotels were renovating and enlarging. Hunters and fishermen came to town, along with the traveling salesmen. Restaurants began to appear. The best in the area were the Herb Farm and Fleming's Chester House. Bell Labs made their appearance in the late 1920's. This opened up Chester to technology. Technology needed access to the facilities. Chester roads again met the demands. A new North-South Highway was constructed. It cut through the western end of the old Landing Road and proceeded through Gladstone and Basking Ridge, on its way to Trenton. The Northern section was cut through Flanders, Budd Lake, Netcong, on its way to Newton and hence to Pennsylvania. This was to be New Jersey State Highway 206 (31). Chester now had two state highways bisecting the town. When the North/South Highway 206 (31) was in the process of being constructed, Chester village people were about to be mired in a "water" controversy. It revolved around the sale of piped water into the houses. Some people thought the idea a good one, others preferred the status quo. Residents of the outlying areas were against piped water because they could not be participants. Feelings were high and the idea was put to a vote. The measure was defeated but the result was the creation of Chester Borough. The year was 1929-1930. The traffic in automobiles increased to the point where the roads had to be macadamized and the result led to the final run of the railroad into Muskrat. Probably the depression also played a part in the closing. Freight and the products were minimal. The Federal Government agencies provided employment for Chesterites. The C.C.C. (Civilian Conservation Corps) and the W.P.A. (Works Project Administration) affected many lives. There are many stands of conifers in all parts of the township that the Corps planted. Few people realize that these trees belong to all of us. There has been much destruction of these stands. World War II and the gas ban propelled Chester into the quiet back-woods town that we enjoyed so much. The inhabitants worked very hard for the war effort, at the Arsenal, at the bomb factory, at the airplane watch, and of course at the Red Cross and Civil Defense. The gas ban resulted in the first Catholic Church in Chester. The church in Mendham was several miles away and the communicants found it impossible to get over the mountain to participate in the services. Saint Lawrence Church was born on Main Street. The war sent almost one hundred fifty men and women to the armed forces. Ten of these never came home. When the war ended, Chester was ready to begin a new building program and take her place as a viable township in Morris County. Chester prepared for her 150th celebration. In 1949, there was a well-organized Fire Department, volunteer, of course, a First Aid Corps, also volunteer, a few good restaurants, several new, small businesses, many gas stations, and several new families. Chester was on the growth road again. In the 1950's, the voters of the Chesters, Washington Township, the Mendhams, and Mount Olive formed a regional district and the result was the West Morris Regional High School District. The school opened in September 1958. Today the district has two high schools, West Morris Central and West Morris Mendham. West Morris Mount Olive resigned from the district and became an independent high school in Mount Olive. The League of Women Voters came to Chester, the Junior Women's Club was formed. Growth brought responsibility. The Chester Township Planning Board came into being.... "the natural beauty of Chester must be preserved. Its land, invaluable for watershed, must be protected." The population grew. There were many families with children. Schools were needed. Three schools were built during the 60's and early 70's to take care of the burgeoning, juvenile population. Two police forces were established. The Township and the Borough each had its own government and separate police force but a consolidated school system. Today there are approximately 2100 homes in Chester Township. The land use is primarily residential and agricultural. Of the 28 square miles or 18,497 acres that comprise the Township, less than 2% is zoned for commercial or industrial use. Over 30% is devoted to permanent open space, 24% is currently residentially developed, and the remaining 39% is in agricultural uses. The Township is almost exclusively served by on-site wells and septic systems. Because of the environmental sensitivity of the area, the zone plan calls for development primarily of single family homes on 2, 3, and 5 acre lots. Based on this zoning, the development potential of Chester Township is an additional 1850 homes. The voters of Chester Township approved a referendum in November of 1995 authorizing the governing body to collect up to $20 per $100,000 of assessed value to purchase additional open space. In 1958, Chester Township changed its form of government from the Township Form to a Faulkner Act form, Small Municipality, Plan C. Its structure includes four Councilmen and a Mayor, all elected at large (not from wards) for three year terms. The candidates run in political parties at regular primary and general election times. Independent candidates, having declared their intentions at primary time, run only in the general election. Plan C is a "strong mayor" form in which the Mayor, as chief executive, is responsible for all administrative functions. The Mayor presides at Council meetings, voting and participating as a member of the Council. He appoints, with Council approval, the following: Tax Assessor, Tax Collector, Clerk, Administrator, Treasurer, Zoning Officer, Construction Official, Court Administrator, Road Superintendent, Attorney, and Engineer. The Mayor is responsible for the budget, enforcing the charter (State law) and all ordinances (local laws), and the preparation of an annual report for the Council and residents. The Council has legislative and policy-making power. It elects a Council President annually to preside in the Mayor's absence. The Mayor appoints the chairman and members of each committee, which are Finance and Insurance, Police, Public Works, and Construction Office. Councilmembers also serve as liaisons to the Recreation Committee, Parks Advisory Committee, Cable TV Committee, and Board of Health. The Mayor and one councilman are members of the Planning Board. The Township Clerk is the liaison between the public and the governing body. The Clerk, who is appointed by the Mayor, receives tenure after five years. Her job encompasses the following: to receive all communications addressed to the Mayor and Council; to attend and keep minutes of all Council meetings and to advertise those meetings and hearings; to register new voters; to receive nominating petitions and act as election official; to act as purchasing agent; and to keep personnel records. A Deputy Clerk assists the Clerk and acts in her absence. The Deputy is appointed annually and does not receive tenure. The Township Attorney and Township Engineer are appointed annually and are paid on an hourly basis. The Attorney is required to attend all Council meetings, with the Engineer attending as necessary.